Cheltenham Town captain Alan Bennett believes his "bad luck" with injuries is over after making his first League Two appearance of the season. Shoulder and calf problems had restricted the 30-year-old to just one game this term - in the Capital One Cup defeat by MK Dons on 11 August. But he returned to Town's defence on Tuesday in their 2-1 win over Oxford, which ended a run of three defeats. "It's been a really frustrating month," he told BBC Gloucestershire. "I was flying in pre-season, with only a little tightness in my hamstring during the MK Dons game. "I trained all that week up to Dagenham and then injured my shoulder, so that put me out for that game. "I was then looking to play against Wycombe but I injured my calf. "It's just bad luck and it's quite common when you're coming back from one injury to pick up another. "It could have been worse, though, so I'm just really happy to come through." 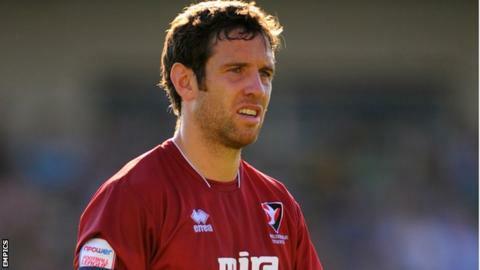 Bennett was ever-present for play-off finalists Cheltenham last season, making 51 appearances in all competitions. The Irishman went on to reveal he had also been affected by the death of his grandfather last month. "I was available for the Aldershot game but my mother rang me and said my grandfather had passed away. It really knocked me back and was a dark couple of days. "We have a massive family - he's got 14 kids, 42 grandchildren and 11 great-grandchildren. "He was a real inspiration and always told me to do my best no matter what happened. He went to all my games when I started at Cork City. "On top of that I couldn't come home and release my frustration on football. "Today [Tuesday] was definitely for him and hopefully I can have a good season for him."